Towering walls alternate between bulging faces and scooped-out hollows. Further yet is the town of Wadi Musa, which lightly lit the sky the prior eve. 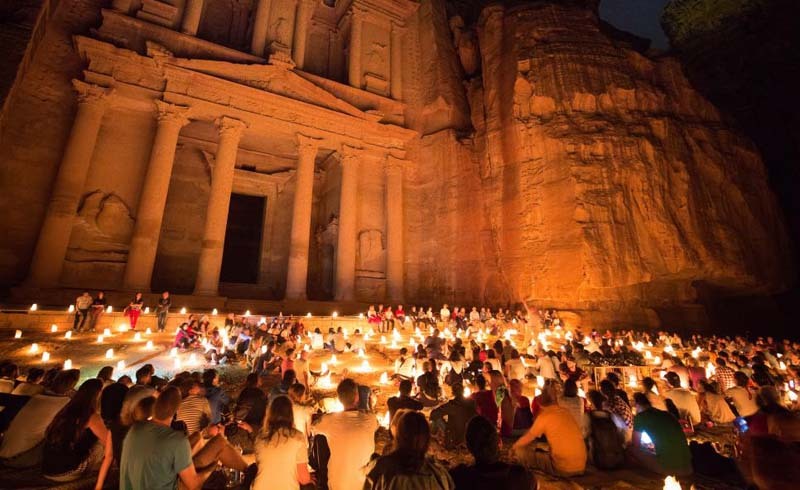 Beyond historic ruins and fascinating geology, Jordan is charged with adventure. From Wadi Rum to expansive singletrack, here’s a handful of the country’s top places to explore. I lean forward and energetically jog over the sandstone belly, which slopes gradually upward on the edge of our camp. The morning is completely still. I hear the soles of my shoes kiss the rock. As I reach the high point, I turn around: To the south, wispy clouds dance in the light blue sky and reflect the strawberry lemonade hue that backlights the buttress. In the foreground, our blue and green tents are pitched hip-to-hip, like a bright caterpillar on the sand. Beyond their curvature, the desert floor gives way to an erratic canyon. Towering walls alternate between bulging faces and scooped-out hollows. Further yet is the town of Wadi Musa, which lightly lit the sky the prior eve. It’s surreal to have woken up here: the solitary, mountainous desert of southwest Jordan. I’m here to explore this awe-inspiring landscape by foot, bike, and jeep with the guidance of Terhaal Adventures, a local tour operator that specializes in adventure travel. It’s my first time in this ancient country, and I want to learn as much the Jordanian saga as possible from the local guides, who also know the backcountry like the back of their hand. I arrived the day before and mountain biked a portion of The Jordan Trail, from the village of Dana to the historic site, Little Petra, otherwise known as Siq Al Barid. Already, I notice the general absence of trail signs, digital maps, and refined singletrack. That is, compared to the immensely-populated Front Range of Colorado, where I lived for nearly a decade. In this Near East culture, the knowledge of how to navigate Jordan’s far-flung, boundless wilderness seems ingrained in my guides and shared through an oral history. As I consider the traditional roots of the nomadic Nabataeans—an Arab Bedouin tribe who founded Petra—the ability of my resident escorts to cross austere terrain with ease and independence makes sense. 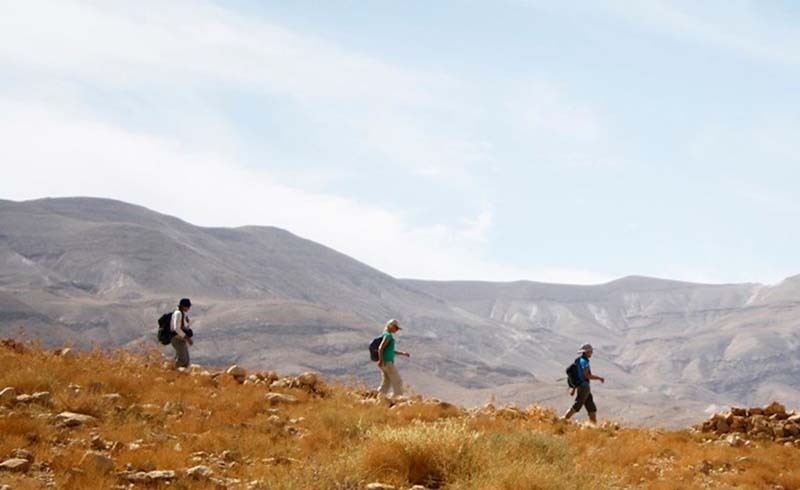 Our camp is nestled into the chalky outcrops of the Mountain Heights Plateau, an upheaved region that divides the Jordan Valley from the eastern desert. From here, we hike on a faint—and, at times non-existent—route through a rugged ravine to reach the back door of Petra: the rose-red, cliff-carved city that famously appeared in 1989’s Indiana Jones and the Last Crusade. The hike’s description is as obscure as it sounds. As we walk along the limestone contour, we run into a few Bedouins—whose ancestors created this byway—but otherwise don’t see a soul. At a tent adjacent to a cliff, they’re serving the country’s staple beverage—strong, sugared tea—which is the perfect spot to stop and be baffled by the expansive Jordan Rift Valley. Four miles after we start, we’ve hiked for close to a few hours. We ascend and crest a pale-and-ebony slope—and my first-glance of the archaic city stops me in my tracks. Carved into the high hills is the rock-cut facade of Al-Dayr, otherwise known as the Monastery, which stretches a shocking 164 feet wide and close to 150 feet high. The earliest historic reference to the city of Petra dates back to 312 B.C.—so it’s mind-boggling for me to imagine workers carving into this cliff face of such intimidating height. We strolled down to the cave tea shop, took a seat to sip tea, and admired the Hellenistic dwelling, dressed in sunlight and surrounded by bright pink bushes of oleander. And this is just the beginning of our amazement: We walk another four miles (6.5 km) through winding ruins, pass the iconic Treasury, and exit through the site’s main entrance. As I walk, I begin to wrap my mind around the artistry, fortitude, and power of this community. At its reign, the shrines and homes of Petra stretched over a 400-square-mile area (1036 square km), and they remained in power for several hundred years. My hair whips around my face as I peer across the most remarkable terrain that’s unlike any I’ve ever seen. Three days later, I stand at the top of 6,000-foot Jebel Um Adami. As far as the horizon, I memorize the elongated sand-filled valleys that expand, like fluid rivers, and wrap around countless rows of rough, granite-and-sandstone peaks. To the south, the limestone mixed into the geology glows slightly green in Saudi Arabia. This place of contrasts, the Wadi Rum Protected Area, astounds me. I realize, I wouldn’t have been able to find this summit—or the back-door route to Petra or idyllic backcountry campsites—without the hospitality of my local Jordanian guides. These vibrant territories and remnants that are emblazoned into my memory hold a special mystery. I hope the feeling of secrecy that they hold never changes.